Iomega had made a name for itself with its Bernoulli Box, a lower cost alternative to SyQuest drives with their hard disk platters. SyQuest had established itself with a 44 MB 5-1/4″ cartridge drive system using the same 130mm platters found in hard drives. By contrast, Bernoulli cartridges had a floppy disk spinning at 3,000 rpm, using the Bernoulli Principle to pull the disk’s surface toward the read-write head. Unfortunately, the original Bernoulli cartridge system used huge media, measuring about 8″ x 11″ (210 x 275 mm). Bernoulli Box II used a smaller cartridge along with a drive that fit in a standard 5-1/4″ bay. Bernoulli drives were noted for their reliability, and they came in many different capacities. Although Apple wasn’t the first to use 3.5″ floppy disks, it was the first to standardize on them instead of the older, larger 5-1/4″ floppies. In the PC world, single-sided 3.5″ floppies held 360 KB of data, double-sided disks 720 KB. On Macs, the same disks stored 400 KB and 800 KB respectively. High-density (HD) 3.5″ floppies arrived in 1987, and both PCs and Macs used them to store 1.4 MB of information. The same year IBM introduced its DSED (Double Sided Extended Density) 2.88 MB floppy drive and disks, which never caught on. The market needed a removable media drive with more capacity than floppies but at a much better price than SyQuest. With their relatively high capacity and low price (initially $20 per cartridge), Zip took off, selling nearly one million in 1995. A few Zip disks could back up most hard drives in 1995; one Zip disk could hold a bootable system plus diagnostics. Zip was also a great way to send files out to a service bureau. Zip disks came preformatted for Macs or PCs, and either could be reformatted for the other platform using Iomega Tools. The SCSI Zip drive allows you to choose one of two possible SCSI IDs, 5 or 6. SCSI ID 6 is rock solid, but SCSI ID 5 can have issues when other devices on the SCSI bus are moving a lot of data. Avoid using SCSI ID 5 if at all possible. How Fast (or Slow) Is It? The SCSI Zip drive performs better on this Mac and the one tested by Lui Gough on his Windows PC, in part because Macs were optimized for SCSI drives in those days while PCs were optimized for ATA drives. The Zip shows itself to be a decent backup medium, writing data at 70-80% of the write speed of the two tested hard drives. As for the floppy, there is no comparison. Zip stores 70x as much data and runs about 15x as fast. This seems to be comparing a 1989 vintage hard drive with two removable media options. Even an older hard drive outperforms Zip 100 and SyQuest 44 for random reads and writes, but the big surprise is that for 256 KB sequential reads, Zip beats the hard drive, while it takes a close second for 256 KB sequential writes, just behind the older hard drive. Overall Zip had decent performance, especially compared to older hard drives. With contemporary mid-1990s hard drives, Zip would fall further behind yet still acquit itself nicely. 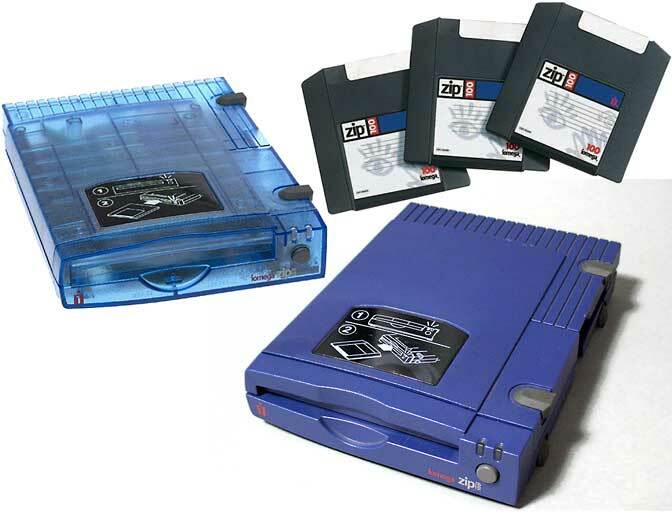 Later versions of Zip supported 250 MB (launched December 1998) and 750 MB (August 2002) of storage. Zip drive sales began their decline in 1999 as CD-R and DVD-R grew in popularity, followed by the explosion in USB thumb drives. IomegaWare 4.0.2 for Windows 98, Me, 2000, and XP. Not compatible with Windows 95 or NT. Iomega Zip 100MB USB Drivers Download, Windows XP, Vista, 7, 8, and 10. Iomega Zip 100MB Parallel Port Drivers Download, Windows XP, Vista, 7, 8, and 10. Iomega Zip 100MB ATAPI Drivers Download, Windows XP, Vista, 7, 8, and 10. Iomega Zip 100MB SCSI Drivers Download, Windows XP, Vista, 7, 8, and 10. IomegaWare 4.0.2 for Mac OS 8.6 or later, OS X 10.1-10.2.1. Drivers are not needed with OS X 10.4, 10.5, and 10.6. With each additional Zip format, Iomega further muddied the waters. It was simple when every Zip disk stored 100 MB and every Zip drive could read and write to it. Zip 250 drives can read and write both Zip 100 and Zip 250 disks, although they write to Zip 100 disks very slowly. Zip 100 drives automatically eject Zip 250 disks as unreadable. Zip 750 drives can read Zip 100 disks but not write to them at all. It is fully compatible with Zip 250 disks. Zip 100 and Zip 250 drives will eject a Zip 750 drive as unreadable. Interestingly, Zip was listed as one of the 25 worst technology products (#15) by PCWorld in 2006 – and one of the 50 best (#23) in 2007! Iomega was acquired by EMC in June 2008, making it part of the world’s largest storage company. EMC and Lenovo partnered in 2013 to create LenovoEMC, which took over Iomega’s business.